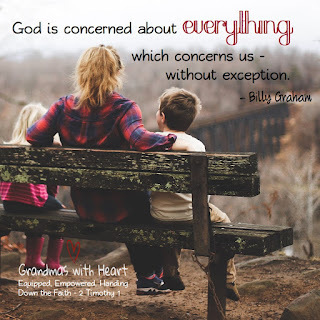 grandma's cookie jar: Believe the Truth - God Cares! With the home-going of Billy Graham, I thought I'd share one of his quotes each day for a week - he shared much wisdom over the years for sure. When we have concerns, when we face challenges, difficulties, sad times and even pain, it is easy for us to think God does not care; but this is not the truth. God does care. He cares about everything and everyone we care about. In all times, but especially the difficult times, we need to hold to the truth - God cares and He loves us. Be sure to model and share this truth with our grandchildren; they will face difficult times in their lives as well and they need to be able to hold on to and trust God, too.